Here is a product that knows what it wants to do and does that very well. It does not try to be something it is not, just straightforward. The GIGALUMI solar path lights currently hold a 4.1 star rating on Amazon.com and have a 66% approval rating. So what exactly do they do so well. The GIGALUMI solar path lights are great at what they are made for. However, trying to use them for any other role would impractical. They are pathway lights and that is basically it. But they are very good at being pathway lights. The LEDs included in the lights only give off between 8 and 10 lumens, which is very low. However, since they are meant to be used to accent a pathway or a garden, they are not meant to be very bright. Plus, the light they give out is a soft amber to better match with your garden and not overpower it. In addition, each light contains a 1.2V 800mAh AA Ni-MH battery which is rechargeable of course. Even though that battery is fairly small, the power of the LEDs is low enough that it poses no issue. In fact, the company quotes the run time of the lights at night for up to 8 hours. However, several customers have reported that their lights easily last up to 10 hours. So small battery or not, it seems to do the job well. The solar panel on the GIGALUMI solar path lights is nothing special, but it gets the job done. They max out at 2V 40ma, which is again very low. In addition, the lights feature a rather small solar panel on each side of it's roof. This is to make up for the lack of adequate space available for a larger solar panel. But light the size of the battery, these lights are not built for power. They do the job of charging the lights for use at night, which they do a good job off. In addition, the solar panels are water and heatproof. So no harm will come to the panels when left out in the summer heat. The body is made from weatherproof plastic. While it is lightweight, it is able to withstand being knocked over or any other fall damage. You should be able to rest easy when using these, just be cautious if you have rambunctious kids or a dog. While these lights do not have any extra features, the design of them is their biggest selling point. They are made to resemble copper lanterns. They have a brownish finish and a powder coating to give them a nice antique look. The lights also feature a large window shaped lampshade and a yellow tint covering the actual light. They really do look beautiful and would work perfectly with a garden or backyard pathway. Even placing them on your deck would make it look very nice. These lights are not specifically meant to brightly light up an entire space, more for giving accent to an area. In which they do a wonderful job. GIGALUMI, also known as Solar Tech International Co., Ltd., is a tech company specializing in solar landscape lighting. They create and design solar lights for outdoor use, including path lights, motion lights, and string lights. All of their products are CE and ROHS certified. While they are based out of China, the bulk of their business takes place in Europe and North America. They are constantly growing and designing new solar lights, as much as new lights every month. The battery of the GIGALUMI solar path lights, while small, easily allows the lights to last for up to 10 hours. The path lights are perfect for accenting a garden or backyard/frontyard area. The amber hue of the lights is soft enough for beautiful lighting. These lights feature a nice, antique lantern design. Perfect for adding decoration to your outdoor area, if you do not want something too modern looking. The lights are completely weatherproof, including heat, water and resistant to fall damage. There is not need to worry about any harm coming to the lights, or the solar panels during your normal day or night. Simplicity and ease is always a great thing to see when installing something. With these, just shove the stake in the ground and flip the switch that is under the lantern roof. These lights are fairly lightweight, so just be careful when you have an outdoor party with a lot of feet. They can be damaged if accidentally stepped on. Also, do not let your dog chew on them. The stake can be a bit flimsy. If the ground is very hard at the place you want to place your lights, it is best to first dig a hole and place the stake in. That is, if you do not want any harm coming to the stake or the fixture. If you are buying these lights for their specific purpose, you should be very happy with these lights. While the specs of these lights would be very disappointing if they were for any other outdoor solar lights. But given that they are meant for providing an accent to an outdoor area like a garden, their specs are perfectly fine. Just do not expect to use them for any other purpose. The GIGALUMI Solar Path Lights are a perfect addition to any garden. On a full charge they can easily last through the night, while providing a soft, amber glow to your area. For $21.99, you get a 2 pack on Amazon.com. So you can easily get 6 of these lights for around $60. Not to shabby. 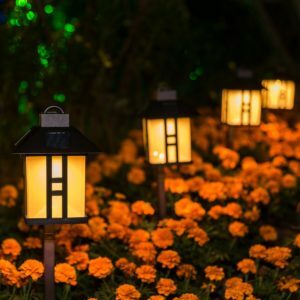 For more information about the other best outdoor solar lights we have reviewed, check out the rest of Green and Growing. Here are some top questions that I found for people seriously considering buying the GIGALUMI Solar Path Lights. What kind of material are they made out of? They are made out of hard plastic that can easily withstand any type of normal weather. Rain, snow, sleet, etc. Will these lights work in areas with limited sunlight during the day? The company recommends placing them in areas with plenty of sunlight. However, a partial charge will still cause them to turn on at night, they just will not last as long. Is there a warranty from the manufacturer? Yes, the warranty is for 180 days after the purchase. There is also great customer service available.